Please Note: This Alexa™ series assumes you have set up your BroadLink™ hub with the phone app (see home theater article series), and you are running Node-RED IoT visual design on the Raspberry Pi. The previous Part 5 of this series discussed how the BroadLink™ RF-IR hub (and Alexa™) can be configured to work with the Node-RED system to control blinds and shades. In this article (Part 6), we'll examine how to enable dashboard switches and buttons that will be the "front end" of the home automation system. This dashboard system will be visible on any wifi enabled device on your local router system (just as the design screens are). The picture below is very similar to the setup in part 4 where we switched lights on and off. We have now added one other component: the dashboard user interface switch (2nd item, named "Spots UI") which allows for a "pass-through" configuration. PLEASE NOTE: The node that follows the DASHBOARD SWITCH is a LOGIC SWITCH. This can lead to confusion as they both have the name - SWITCH - but note that the icons that identify the node type (left side of each node) are very different, as are the colors. We have also renamed the FLOW tabs as LIGHTS, BLINDS, and TEST. There is a potential system design problem, depending on how you "wire" these nodes together. At first we had the UI switch wired as a "dead end" flow, which caused a lack of synchronization between the Alexa™ node and the UI switch on the user interface. If we told Alexa™ to turn on the lights, the UI switch would have no knowledge of this action, and it would stay in the OFF position. This picture is captured from the "Spots UI" switch properties dialog that appears when the "Spots UI" node is double-clicked. When this option is checked, the control signals flow through this node, regardless of how the lighting system is activated. The node is "smart" enough to check the trigger signal and determine whether the switch position should be ON or OFF. This is a very good example of how easy the Node-RED automation system is to set up. In other systems, this particular problem can often be very difficult to resolve; using Node-RED provides a very easy solution. There are also other switch settings for UI labels, sizes, icons, etc. 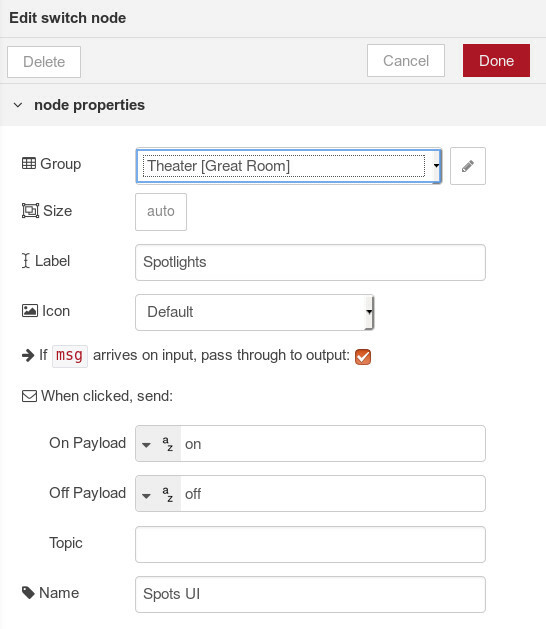 At this point we have created the first control for lights in the Node-RED dashboard interface, and if you have done a similar thing you should be able to click or tap the switch in the user interface (UI) to turn lights ON and OFF. Conversely, if you use Alexa™, or the design screen inject buttons, you should see the switch turn on and off, tracking your other actions. In the next article we'll do the same with the blinds. The TOPIC parameter refers to an MQTT identification "tag" that you can use to further delineate messages as they flow through a system. We aren't using it in this particular case, because the Alexa™ node has no setting for it, but we will briefly explain its use, as it is quite important. "MQTT is a machine-to-machine (M2M) 'Internet of Things' connectivity protocol. It was designed as an extremely lightweight publish/subscribe messaging transport. It is useful for connections with remote locations where a small code footprint is required and/or network bandwidth is at a premium."